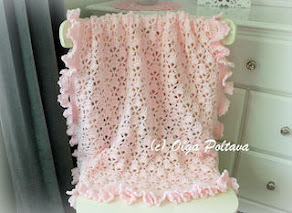 Earlier this week I finished a pink pineapple doily. Its vintage pattern is from 1951. I have a small round table that I occasionally set up in the garden for a cup of tea. 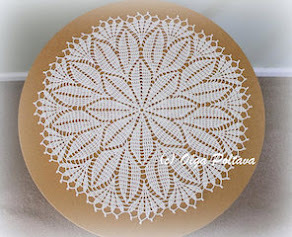 My new doily is perfect as a table topper for it. The size is just right. 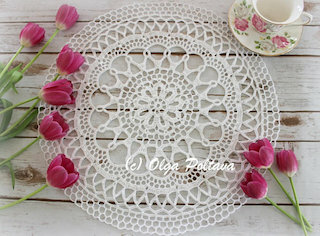 Yesterday I had a chance to use my new doily. I managed to get both my boys to take their naps (usually the older one does not sleep during the day), so I had a bit of quiet time to myself. Typically I would sit down and crochet, but yesterday I decided to spend my quiet time reading (usually I only read before going to bed). And my backyard seemed as a perfect place for it. I brew myself a mug of tea and set up a cozy little spot. I spent about an hour reading. I’m a big Agatha Christie’s fan, and right now I’m reading The Body in the Library. I’m also reading a book by John Curran called Agatha Christie’s Secret Notebooks. Both books make great reading and I took pleasure in reading a bit of each. I also enjoyed my tea, my new doily, a few blooms from my yard, and my short solitude. Ch 11, join to form a ring, ch 3, 24 d c in ring, join in 3rd st of ch. 2nd Round. Ch 6, tr c in next d c, * ch 2, tr c in next d c, repeat from * all around, ch 2, join in 4th st of ch (25trc). 3rd Round. Sl st into loop, ch 5, d c in same loop, * 1 d c, ch 2, 1 d c in next loop, repeat from * all around, join in 3rd st of ch. 4th Round. Sl st into loop, ch 6, tr c in same loop,* 1 tr c, ch 2, 1 tr c in next loop, repeat from * all around, join in 4th st of ch. 5th Round. Sl st into loop, ch 6, d c in same space, * 1 d c, ch 3, 1 d c in next loop, repeat from * all around, join in 3rd st of ch. 6th Round. Sl st into loop, ch 8, tr c in same space, * 1 tr c, ch 4, 1 tr c in next loop, repeat from * all around, join in 4th st of ch. 7th Round. Sl st into loop, ch 5, d c in same space, * 1 d c, ch 2, 1 d c in space between next 2 tr c, 1 d c, ch 2, 1 d c in next loop, repeat from * all around ending round with 1 d c, ch 2, 1 d c in last space, join in 3rd st of ch. 8th Round. Sl st into loop, ch 6, tr c in same space, * 1 tr c, ch 2, 1 tr c in next loop, repeat from * all around, join in 4th st of ch. 9th Round. Sl st into loop, ch 6, d c in same space, * 1 d c, ch 3, 1 d c in next loop, repeat from * all around, join. 10th Round. Sl st into loop, ch 3, 1 d c, ch 2, 2 d c in same space, * ch 4, s c in next loop, ch 4, 1 tr c, ch 4, 1 tr c in next loop, ch 4, s c in next loop, ch 4, 2 d c, ch 2, 2 d c (shell) in next loop, shell in next loop, repeat from * all around ending round with ch 4, s c in next loop, ch 4, 1 tr c, ch 4, 1 tr c in next loop, ch 4, s c in next loop, ch 4, shell in next loop, join. 11th Round. Sl st into shell, ch 3, 1 d c, ch 2, 2 d c in same space, * ch 2, skip 2 loops, 10 tr c in next loop, ch 2, skip 2 loops, shell in next shell, ch 1, shell in next shell, repeat from * all around ending round to correspond, ch 1, join. 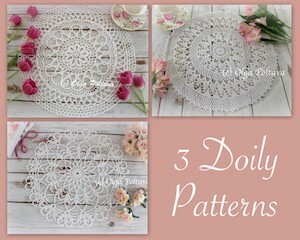 All shells are worked in same manner for remainder of doily. 12th Round. Sl st into shell, ch 3, 1 d c, ch 2, 2 d c in same space, * ch 2, 1 tr c in each of the next 10 tr c with ch 1 between each tr c, ch 2, shell in next shell, ch 1, shell in next shell, repeat from * all around ending round to correspond, ch 1, join. 13th Round. Sl st into shell, ch 3, 1 d c, ch 2, 2 d c in same space, ** ch 2, s c between 1st 2 tr c, * ch 3, s c between next 2 tr c, repeat from * 7 times, ch 2, shell in next shell, ch 1, shell in next shell, repeat from ** all around ending round to correspond, ch 1, join. 14th Round. Sl st into shell, ch 3, 1 d c, ch 2, 2 d c in same space, ** ch 3, skip 1 loop, s c in 1st loop of pineapple, * ch 3, s c in next loop, repeat from * 6 times, ch 3, shell in next shell, ch 1, shell in next shell, repeat from ** all around ending round to correspond, ch 1, join. 15th Round. Same as last round but having 1 loop less in each pineapple. l6th Round. Same as 15th round but having ch 3 between the 2 shells in each section, ch 3, join. 17th Round. Sl st into shell, ch 3, 1 d c, ch 2, 2 d c in same space, ** ch 3, s c in 1st loop of pineapple, * ch 3, s c in next loop, repeat from * 3 times, ch 3, shell in next shell, ch 2, 1 tr c, ch 3, 1 tr c in next loop, ch 2, shell in next shell, repeat from ** all around ending round tocorrespond, join. 18th Round. Sl st into shell, ch 3, 1 d c, ch 2, 2 d c in same space, **ch 3, s c in 1st loop of pineapple, * ch 3, s c in next loop, repeat from * twice, ch 3, shell in next shell, * ch 2, 1 tr c, ch 3, 1 tr c in next loop, repeat from * twice, ch 2, shell in next shell, repeat from ** all aroundending round to correspond, join. 19th Round. Sl st into shell, ch 3, 1 d c, ch 2, 2 d c in same space, ** ch 3, s c in 1st loop of pineapple, * ch 3, s c in next loop, repeat from * once, ch 3, shell in next shell, ch 2, * 1 d c, ch 2, 1 d c in next loop, repeat from * 6 times, ch 2, shell in next shell, repeat from ** all around ending round to correspond, join. 20th Round. Sl st into shell, ch 3, 1 d c, ch 2, 2 d c in same space, ** ch 3, skip 1 loop, s c in next loop of pineapple, ch 3, s c in next loop, ch 3, skip 1 loop, shell in next shell, ch 3, skip 1 loop, cluster st in next loop (cluster st: 3 d c in same space keeping last loop of each d c onhook, thread over and pull through all loops at one time), * ch 3, cluster st in next loop, repeat from * 5 times, ch 3, shell in next shell, repeat from ** all around ending round to correspond, join. 21st Round. Sl st into shell, ch 3, 1 d c, ch 2, 2 d c in same space, ** ch 3, s c in remaining loop of pineapple, ch 3, shell in next shell, * ch 2, 1 tr c, ch 2, 1 tr c in next loop, repeat from * 7 times, ch 2, shell in next shell, repeat from ** all around ending round to correspond, join. 22nd Round. Sl st into shell, ch 3, 1 d c, ch 2, 2 d c in same space, ** shell in next shell, ch 2, skip 1 loop, * 1 d c, ch 2, 1 d c in next loop, repeat from * 14 times, ch 2, skip 1 loop, shell in next shell, repeat from ** all around ending round to correspond, join. 23rd Round. Sl st into shell, ch 3, cluster st in same space, ** cluster st in next shell, ch 3, skip 1 loop, cluster st in next loop, * ch 3, cluster st in next loop, repeat from * 13 times, ch 3, skip 1 loop, cluster st in next shell, repeat from ** all around ending round to correspond, join. 24th Round. Sl st into 2nd loop, ch 4, tr c in same space, * ch 2, 2 tr c in next loop, repeat from * 12 times, skip 2 loops, 2 tr c in next loop, repeat from 1st * all around in same manner skipping last 2 loops and joining in 4th st of ch. 25th Round. ** Ch 4, skip 1 loop, * d c in next tr c, ch 4, sl st in 3rd st from hook for picot, ch 1, d c in next tr c, ch 3, repeat from * 10 times, d c in next tr c, ch 4, sl st in 3rd st from hook for picot, ch 1, d c in next tr c, ch 4, skip 1 loop, s c in center space between next 4 tr c atbase of scallop, repeat from ** all around, join, cut thread. 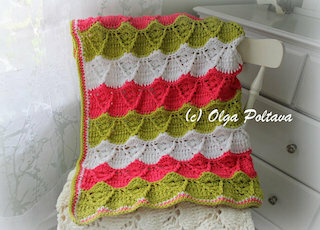 This stitch is a variation of good old shells. To make it “lacy” I added chains between the shells. Perhaps it wouldn’t be the best choice for a baby blanket (I think the holes are too big), but I can imagine a chunky scarf or cowl made with this stitch will look quite pretty. Turning ch 3 is referred to as “last dc” at the end of rows. Row 1: shell in 6th ch from hook, *ch 3, skip 6 ch, shell in next ch* across; dc in last ch. Ch 3, turn. Row 2: *shell in next shell, ch 2, sc in next ch-3 space, ch 2* across, ending with shell in next shell; dc in last dc. Ch 3, turn. Row 3: *shell in next shell, ch 3* across, ending with shell in next shell; dc in last dc. Ch 3, turn. 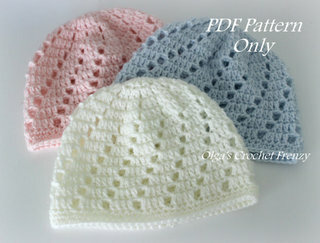 Back in February I shared my pattern for a V-stitch newborn beanie. 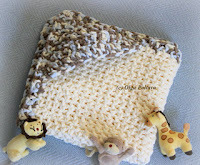 This is the same pattern but adjusted for a bigger size (3-6 months). 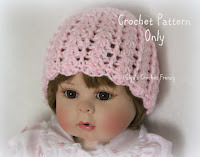 The hat measures about 14 inches (35.5 cm) in diameter and 6 inches (15.25 cm) in height. 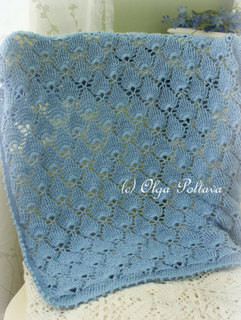 I used Bernat Baby Sport yarn, and US size E (3.5 mm) hook. Gauge: 3 first rounds = 3.5 inches (almost 9 cm). In this pattern V-st is (dc, ch 1, dc) all in same space. Round 5: Sl st into next ch-1 space, ch 4, dc in same ch-1 space, *V-stitch into next space between 2 V-st, V-st into next 4 V-st* 4 times, V-st into next V-st. Join with sl st into 3rd ch of beginning ch-4. Round 6: Sl st into next ch-1 space, ch 4, dc in same ch-1 space, V-st into each V-st around. Join with sl st into 3rd ch of beginning ch-4. Rounds 7- 14 same as Round 6. Round 15: Ch 1, *sc in next V-st, sc in next space between two V-st* around. Join with sl st into beginning ch-1. 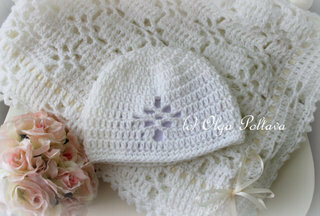 The pattern for this beanie in newborn size is available here. 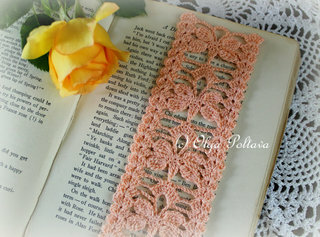 Each of these lovely butterflies requires only 5 yards of cotton thread and about 5-7 minutes to crochet! But number of ways one can use them is endless. For instance, I can imagine how darling they would look as appliqués on a little girl’s dress. Or maybe as hairclips in her hair. I can also picture such butterfly as a decoration on a small wrapped present. A butterfly pin would look lovely on a hat or a purse. They are quite small (only about two inches across) and can be used for handmade cards and lots and lots of other craft projects! I can’t believe I’ve been working on this tablecloth for a year now! But finally I’m getting towards the end. 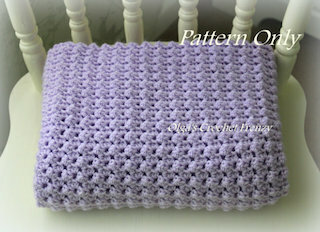 I only need to crochet a couple more square motifs! I already started blocking my motifs. I thought it would be easier to block them separately and then join together rather than blocking the entire big piece. I don’t use the fancy blocking technique with pins and padded surface. What I do is I wet the motif, gently squeeze the access water, put it on a towel, and smooth and straighten it. Once the motif dries, it looks much better than it did before. I also started joining the motifs together. This job is even more tedious and boring than crocheting the motifs! So far I only joined four motifs, but I must tell you I had to redo it twice. The first time, I noticed that one of the motifs was joined with the wrong side up. So I had to undo it. The second time, I missed one stitch and as the result, the meshes weren’t matching. So I had to undo it again. That was quite frustrating, but at last all the four motifs were joined correctly. By the way, I use slip stitch on the wrong side to join the motifs since I don’t really know of any other way of joining them. It looks really nice so far. Once all the motifs are joined, I'll start working on the trim (still sounds like a lot of work). Then I will only need to iron the tablecloth (especially the seams) and it will be done! Last week I posted my pattern for a newborn hat made in lacy stitch, and I promised to work out the same pattern for a bigger size. Here it is! I made two of these hats – one in yellow and one in green. Both look lovely. The hat measures about 15 inches in diameter and 6 inches in height. 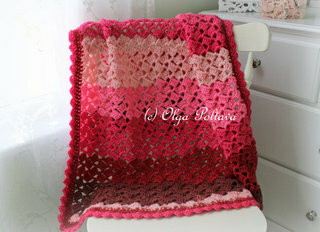 I used Snuggly Wuggly yarn by Loops and Threads and size E (3.5mm) hook. Gauge: 3 first rounds = 3.5 inches. Also, when I refer to “shell”, I mean 3 dc in same space. Round 6: Ch 3, 2 dc in same space, *skip 4 spaces, 3 dc in next space, ch 3, skip 2 spaces, sc in next sp, ch 3, skip 2 spaces, 3 dc in next space* around, ending with ch 3. Join with sl st to 3rd ch of beg ch-3. Round 7: Ch 3, 2 dc in same space, *skip 4 dc, 3 dc in next dc, ch 3, sc in next sc, ch 3, 3 dc in next dc* around, ending with ch 3. Join with sl st to 3rd ch of beg ch-3. Round 9: Ch 3, 2 dc in same space, *ch 3, sc in space between next 2nd and 3rd dc (it’s the space between two shells), ch 3, skip next 2 dc, 3 dc in next dc, 3 dc in next dc* around, ending with 3 dc in next dc. Join with sl st to 3rd ch of beg ch-3. Round 10: Sl st to last dc of shell, ch 3, 2 dc in same space, *ch 3, sc in next sc, ch 3, 3 dc in next dc, skip next 4 dc, 3 dc in next dc* around, ending with 3 dc in next dc. Join with sl st to 3rd ch of beg ch-3. Round 11: same as Round 10. Round 12: sl st to last dc of shell, ch 3, 2 dc in same space, *3 dc in next dc, ch 3, sc in space between next 2nd and 3rd dc (it’s the space between two shells), ch 3, skip next 2 dc, 3 dc in next dc* around, ending with ch 3. Join with sl st to 3rd ch of beg ch-3. Round 13: same as Round 7. Round 14: same as Round 7. Round 15: ch 1, sc in same st, sc in next 5 dc, *2 sc in next ch-3 space, sc in next sc, 2 sc in next ch-3 space, sc in next 6 dc* around, ending with 2 sc in ch-3 space. Join round with sl st. 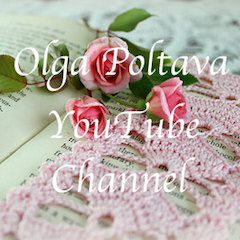 This is my first ever written pattern for a doily! I did sketch a few doily symbol charts in the past, but my goal is to learn how to write instructions as well. When one is learning, a good idea is to start with a small and easy project because a big one can be too overwhelming and discourage the learner. Don’t you agree? So I started with a small doily (only seven rounds), which involved basic stitches such as single crochet, double crochet, slip stitch, and of course chains. The design is not intricate at all, but as I said this is my learning attempt. 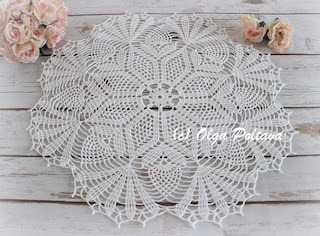 I do hope to be able to come up with more elaborate doily designs in the future. 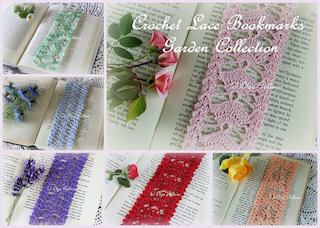 I used size ten crochet thread and size 5 Boy’s steel hook. 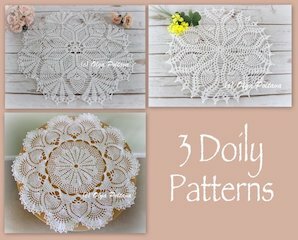 The doily measures 5 inches in diameter. Ch 12, join with sl st into ring. Round 6: Ch 3, 2 dc in space between 2 dc-3 groups of previous round, ch 5, sc in next sc, ch 5, *3 dc in space between next 3rd and 4th dc (in between next 2 dc-3 groups), ch 5, sc in next sc, ch 5* around, join with sl st into 3rd ch of beg ch-3.